Home » News and Stuff » Uncategorized » Making it All Worth While. Making it All Worth While. I’ve written little stories all my life. Mostly for my own entertainment, but have occasionally let these drift out to family and friends. It’s always been great to get a positive response, but when it is from family and friends we all know it will be tinged with well-meaning bias. Writing a book, that will be read by people who I don’t know, is as wonderful as it is daunting. You kid yourself that reviews don’t matter – but of course, deep down, they do! I’ve been incredibly lucky with my reviews (so far!). The first ones were from book reviewers and bloggers who were fortunately very generous with their lovely words. Some fellow authors have given similarly squee inducing support for my story. People who don’t know me and are not in any way obliged to say nice things – have said nice things. I don’t take any of that for granted. I am hugely grateful and flattered. But nothing – NOTHING – is quite like getting a comment from an actual reader. The aim of my silly story was to entertain children (I love the idea that grown-ups are entertained but that was not my primary aim). Seeing children’s reactions when I’ve visited schools and libraries has been amazing and I genuinely treasure the comments I’ve had from them. I little while ago, I received a message via my website from a mum telling me how much her daughter had enjoyed reading my story. It was such a lovely message I sent a small token of my thanks. 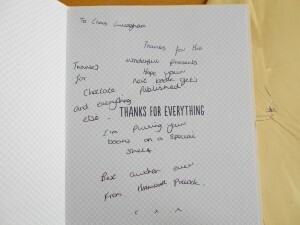 Today I received a card sent via my publisher – it has made my week (and what a terrible week or so it has been!!). Reviews from Bloggers/Reviewers/Authors are always welcome and 5 star reviews on Amazon are gratefully received (hint, hint!! 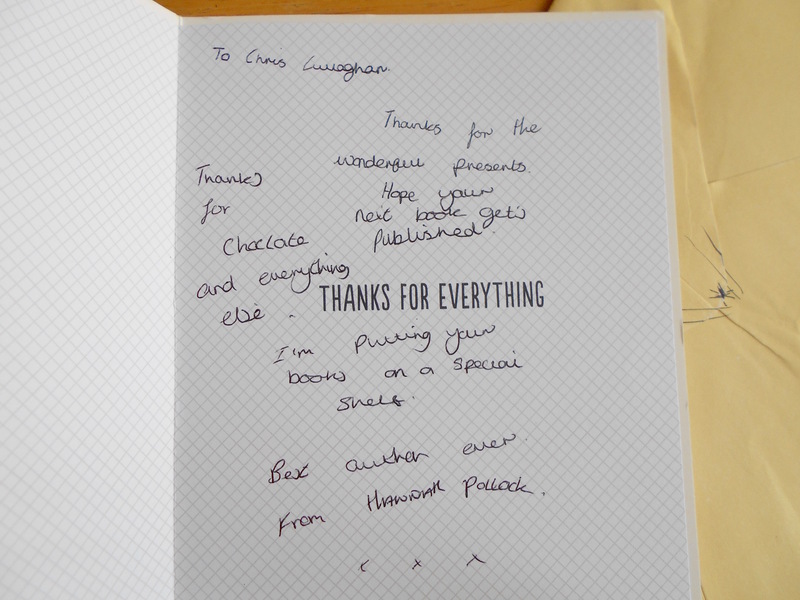 ), but a hand written note from a proper reader is a pure joy. Thank you for taking the time to write and for making my story part of your reading journey. I hope it is a long and wonderful journey. I will put your card on a special shelf too. ← One of The Best New Children’s Books!